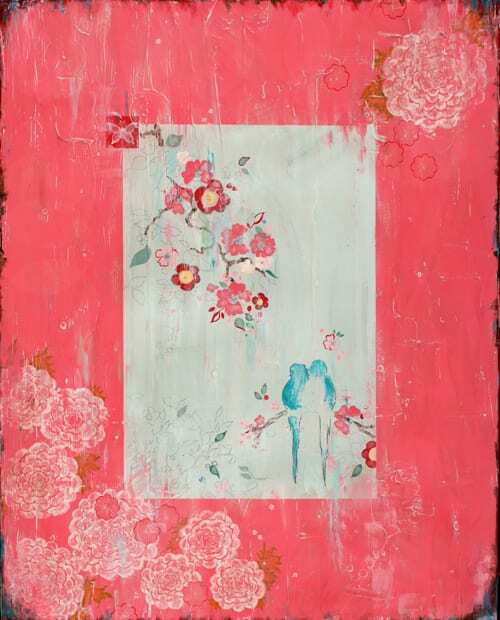 Today, I’m delighted to feature an interview with artist, Kathe Fraga, together with examples of her beautiful floral-inspired work. I’m a painter and I live on a small island, Bainbridge Island, about a half hour by ferry from Seattle, Washington. I love the feel of the island…one main street, lots of towering evergreen trees, beaches and isolation. The fog and the grey misty days are so inspiring, perfect for spending long days in my studio in my home…a rustic, rambling and moody 1905 stone house by the Salish Sea. I walk along the sandy beach in the morning with my pups and collect all sorts of weathered and worn blue and white china shards. Their patterns weave their way into my work with their age old motifs. 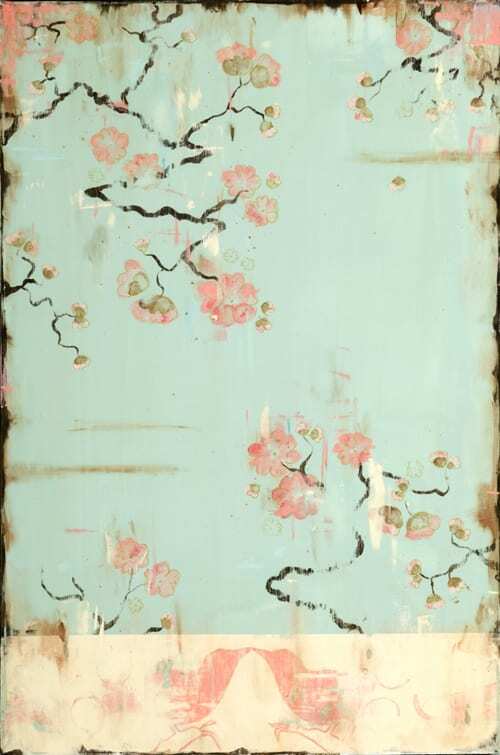 My paintings are based on the wonderful decades, hand-painted Chinoiserie, as well as layered and distressed walls of Parisian mansions. I’ve always painted since forever. Painting and drawing, dreaming and imagining are the essence of who I am and have always been. I can’t remember a time that I wasn’t drawing or creating something. The turning point for me, as an artist, was when my husband and I, with our love for art, decided to open an art gallery on our island in 2002. We had held arts fairs in our home…hosting 17 or 18 artists (including my own work) and craftspeople during the island’s Winter Arts Fair and enjoyed it so much. But given the work and planning that went into one weekend of art, we decided to offer a year-round representation of the arts and artists. Our gallery, Gallery Fraga, was a wonderful experience for us. We spent six years and countless hours researching, representing and hosting artists, both local artists and others as far away as the East Coast, Europe and Canada. I have never ceased to be inspired, and I take great joy in artists and their art..But there came a time when it was ‘my time’. 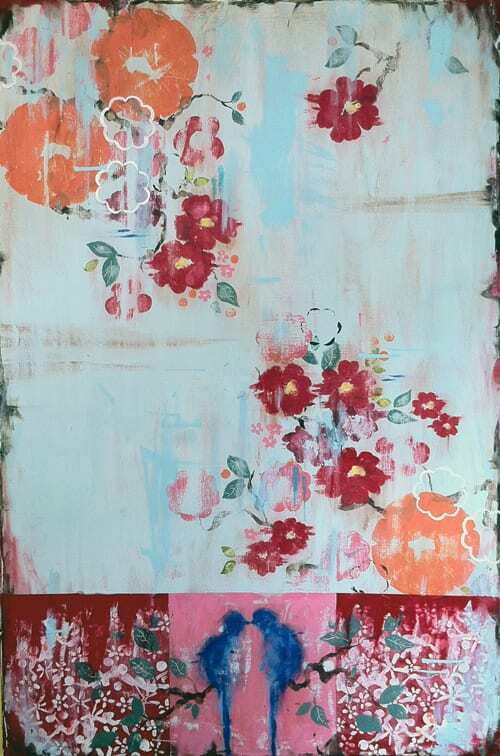 ‘My time’ to focus on what meant so much to me and how I paint…my beloved and favorite colors (pinks, blues, oranges and soft greens), Asian-inspired patterns, the compelling and mysterious ‘tug’ of old vintage beauty, long-forgotten wallpapers and faded Paris frescoed walls. ‘My Story’…it needed to be painted and shared and told. As we closed our gallery, I was so happy to have my work embraced by galleries in the Seattle area, as well as New York and Washington DC and (to come) Palm Springs. My paintings have now been translated into greetings cards, prints, journals, pillows. Could you tell us about your particular style of painting? My paintings are based on my life story. I grew up on the move…both coasts of the United States, South America and Europe. 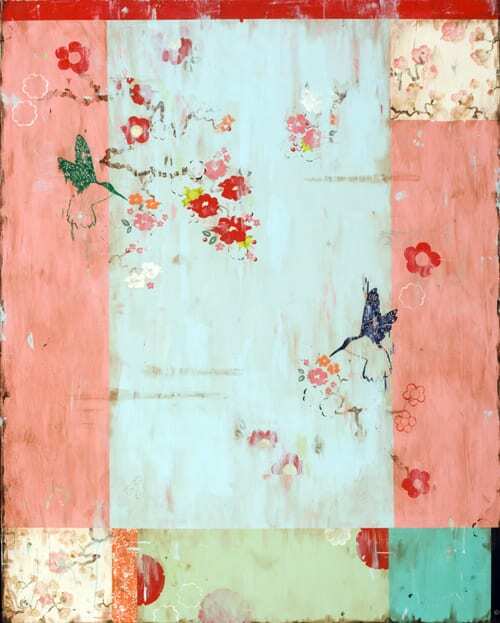 I absorbed the faded, yet vibrant and unexpected, colors from these places, the beautiful decay of the old mansions, fountains, the patterns of flowers, fabric and wallpaper. 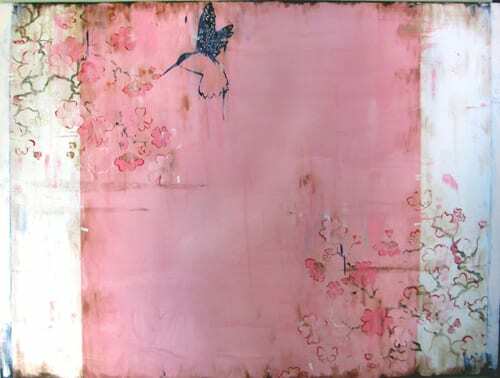 You can see the stories in my paintings…layers and layers of colors scraped away to reveal a hidden flower or bird, a color that doesn’t quite match (but it does) and romantic pairings of birds, butterflies and botanical. 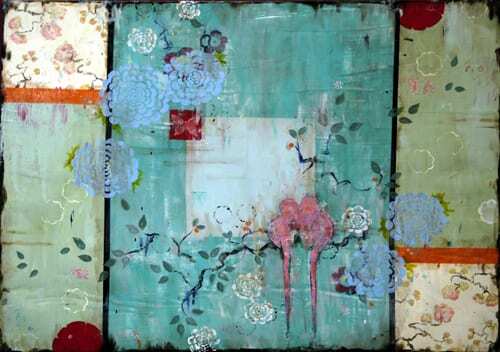 I infuse and frost my canvases with fresco. They dry under the island sun…sometimes a few pine needles or a splash of a raindrop join the story of the canvas. And then I paint. My ‘French Wallpaper Series’ is all about color, texture, the love of old, the whispers from generations that came before, of relationships. I let color and shape tell a story and I paint very small details and then very large ones. I paint over some parts of my paintings to give a suggestion of a story that was being told but interrupted by another. Have you ever lived in an old house that you’ve fixed up…perhaps a bedroom or the kitchen? You take down a cabinet or pull down a window molding and then there, like treasure, like a voice from the past, you see a lovely old patterned wallpaper that’s been hiding till now. It’s just magical. Who put it there? What was their life all about in this home? What was their story? I see my paintings as parts of a larger frescoed wall, taken from a place from long ago. 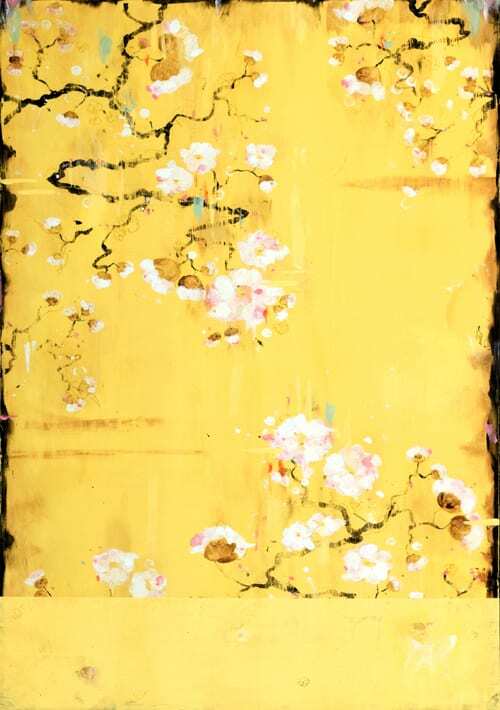 That’s why flowers will run off the edges, or patterns will continue beyond the canvas. What you might see up close is different from what you might notice from afar. What seems to ‘pop’ in the morning light might take a background role by candlelight. A family member was in a Seattle Hospital a few months ago. I remember going to visit and being so grateful for the art on the walls. That’s why I was so delighted and honored to have my work selected for the collections of three major Pacific Northwest hospitals. There is nothing worse than staring at a white wall when you’re sick or worried! The other day, I received an email that really meant the world to me…a woman wrote that she had been at the hospital, waiting for test results and how my art had made the wait more bearable…the colors, and the birds and the layers took her mind away a bit and she wanted to say ‘thanks’. What are your plans for the remainder of 2012 and 2013? The year ahead will be very busy. My next solo show will be February 2013 at Roby King Galleries on Bainbridge Island. It’s always so nice to show in your own home town. I’ll also be showing at Museo Gallery in August 2013 and looking forward to my new gallery representation in Palm Springs, California this autumn. I’ve partnered with a wonderful Canadian company, ‘Ecojot‘, which has licensed my original paintings as covers for their Jumbo Journals. Four of my designs were introduced at the New York Stationery Show as part of their collection earlier this year. 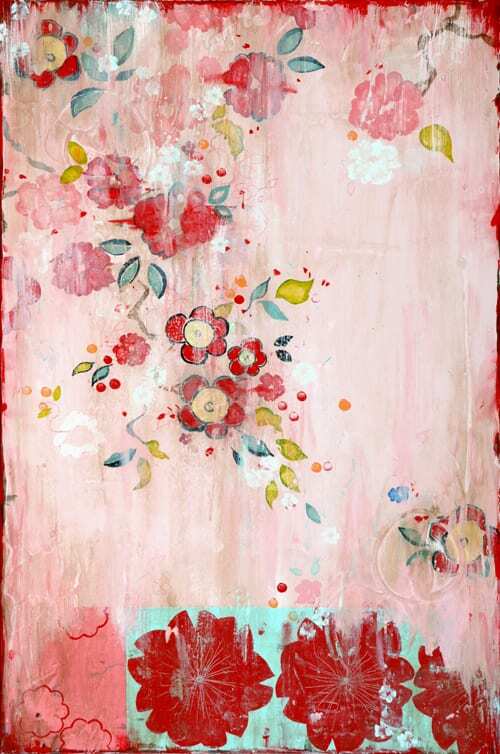 I’m also excited to announce the launch of the Kathe Fraga Home Collection. I will be introducing a series of exclusive new pillows based on my paintings in 2013 and adding to my greeting card collection. I’m looking forward to making my art available to more people in more ways than ever before. A big fat blue hydrangea…Nikko Blue. It’s old-fashioned and I love everything about it…the round shape, the color and the way it reminds me of Nantucket…a place we love! I use the hydrangea motif a lot in my paintings…sometimes white, sometimes blue. 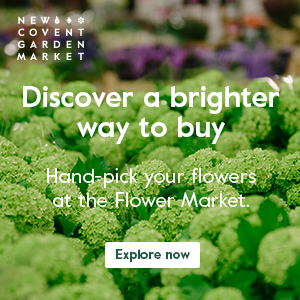 It brings to mind vintage heirloom lace, lovingly passed down through the generations. I like how I can paint hundreds of tiny wee hydrangea petals yet the resulting circle still speaks as one. I like to paint them as singles, floating above a bird or butterfly, or clustered all together in an overlapping and loving bouquet. My little garden in the back of our grey beach stone house is filled with hydrangeas. And so is the dark old front hall, where a big estate find crystal vase overflows with hydrangeas that we’ve dried, reminding me, in the midst of our rainy, drippy island winters, of summers and sunshine of the past and gardening and fresh new blue blooms to come. 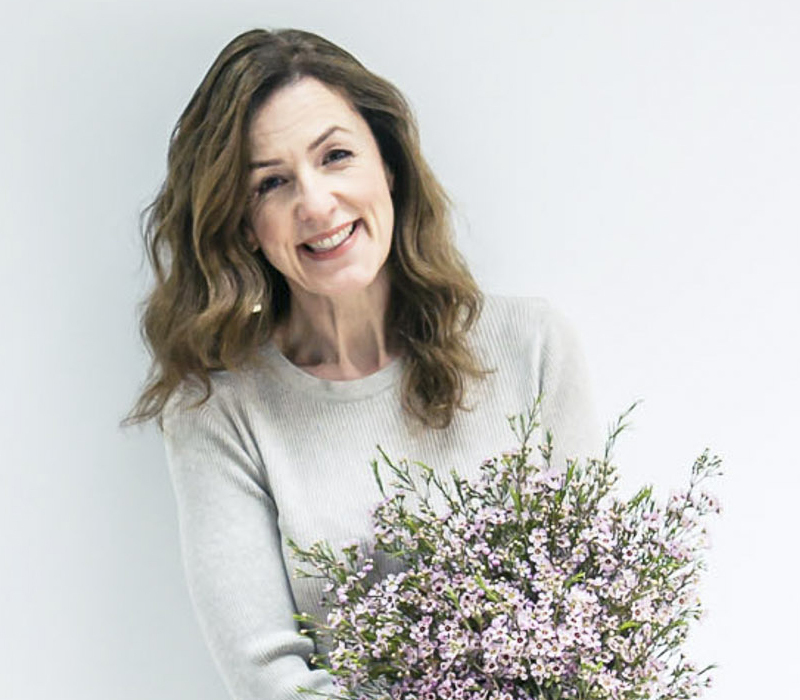 I hope you’ve enjoyed reading Kathe’s wonderful interview today. If you’d like to keep up-to-date with her news, she’s on Twitter and Facebook, plus has a blog. I love them too!! Thanks for sharing. Thank you very much Nikki and Liz for your lovely comments :-). You are more than welcome Kathe :-)! I adore all of your work. They are such happy, calming painting. Totally Love!